The difference between a chickadee's core temperature and winter air temperature in Alaska can be as much as 150°F - but chickadees have a heavy down coat and other adaptations to shield them from the cold. Active, acrobatic and agile with a perky cheerful air, the chickadee is one of the most widely recognized birds in Alaska forests. The black-capped chickadee is one of four chickadee species that occurs in the state and has a black cap and bib, white cheeks, soft gray back, wing feathers gray edged with white, and soft buffy-colored underparts grading to white in the center. Its song is often a 2 or 3 note whistle that sounds like "Hey, sweetie." Look and listen for their flocks in forest habitat, residential neighborhoods and parks. Territorial during the breeding season, chickadees flock during the rest of the year. Small flocks made up of several adult pairs and unrelated juveniles are commonly seen from late summer through winter. Flocks of chickadees sometimes cross paths with kinglets, creepers, nuthatches and downy woodpeckers and form temporary associations. 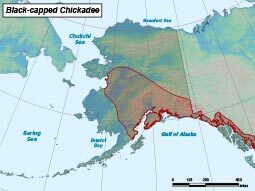 Chickadees are specially adapted to endure Alaska's rugged winters. They have much denser, better-insulating plumage than other songbirds their size and a special ability to put on fat quickly. Birds burn fat as fuel to keep themselves warm in winter. A chickadee can put on eight percent of their body weight in fat each day. 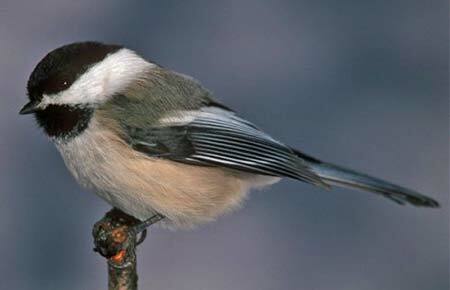 Chickadees are also able to drop their body temperature at night in order to conserve their winter fuel. Pairs bond sometime during the winter flock period and begin to build a nest by late May. The nests are located in holes in trees. Usually the female begins excavating the cavity with some assistance from the male. The nest itself is built of soft materials, like hair, fur, and a few feathers, on a base of dry moss. The female alone lines the nest while the male remains nearby. Egg laying, in clutches of one to 11 eggs, begins two or three days later. As the female incubates the eggs, the male enters the hole only to feed the female. Most eggs hatch at 15 days. The female eats the egg shells, some believe for the calcium. Both parents feed the young and fledging normally occurs within 18 days. The young stay with their parents for another two weeks after fledging and subsequently disperse. Chickadees are very acrobatic as they glean insects and insect eggs and larvae from leaves, twigs, branches and bark. Most of their diet is caterpillars and eggs of moths, aphids, scale insects, beetles and other insects and spiders. They may pull the wings off moths and discard them before eating the insect. Seeds and berries are also eaten and fat may be scavenged from animal carcasses. Like most chickadees, the black-capped chickadees store food regularly, a habit that is probably critical for winter survival. Chickadees generally stick to their breeding range year round but periodic irruptions occur outside their range, usually during fall, winter and spring. Irruptions southward are probably related to food shortages. The black-capped chickadee is found in deciduous and mixed forests, open woods, willow thickets, cottonwood groves, parks and disturbed areas. The chickadee generally remains within its breeding range throughout the year but periodically disperses during fall and winter. Flocks of six to 12 chickadees roam over winter feeding ranges of about 40 acres, regularly visiting known food sites. They normally return each evening to roost among a particular patch of trees though some find shelter in cavities, under the eaves of houses or other protected sites. The birds may migrate short distances. Because they nest in tree cavities, black-capped chickadees may suffer if too many dead trees are cleared from forests. Deciduous and mixed forests across the north-central US and up into Interior Alaska. Very few but known nest predators include red squirrel and black bear.